The MN GOP Convention ended yesterday as MC predicted a week or so ago: Kurt Bills as the endorsed senate candidate and a sweep of all 13 at large delegates and 13 alternates for the Ron Paul forces. The MN GOP State Central Committee met following the conclusion of the endorsing convention and its results were the same as previously predicted by MC: Janet Beihoffer won a crushing victory over Ron Paul favored incumbent Pat Anderson. As a friend of MC's texted: "I hate it when you're right." So does MC. What to make of what has just happened to the Republican Party of Minnesota? It depends on whether one is in the old (elected) guard trying to ride what they think is a wave that will fade or whether one is an activist who knows what's really going on, what the Paul forces truly represent. To begin, a high school teacher that Ron Paul organizer Marianne Stebbins hand picked won the endorsement because of the overwhelming, amazing organizing efforts of her Ron Paul forces. MC has had many media interviews recently but in each has noted this strength, her strength. There is simply no room not to give her her due. It would be churlish otherwise. And here's a tip of the hat to Juliette & Corey; they have a sense of humor and that's not nothing these days. Many GOP activists have asked why so many in the House and Senate fell in behind Kurt Bills. Having spoken to many of them, and raising that concern, it was clear that those in each chamber had little understanding of the damage the Paul activists were doing to the Minnesota Republican Party generally. This makes sense; it's of a piece with their poor decision making when electing party leadership. Having failed so badly at the latter, how to expect more of them with regard to the former? David Duke admirer Ron Paul addressed the convention in the afternoon on Friday. MC walked out. It wasn't very brave, just honest. It wasn't like hiding Anne Frank although if Duke and Paul had their way, MC's carriage house would be full up. Paul called for legalizing hemp and raw milk to much applause. How so called party leadership could remain on the dais while he spoke is a mystery. When they look in the mirror they must not see anything. The Severson & Hegseth campaigns were road kill on the way to the Paulbot candidate's endorsement. Neither seemed to understand what they were up against. Severson had already lost a statewide campaign and was a poor fundraiser. Hegseth seemed like a Stepford Husband, ready to take orders but incapable of knowing his own mind or, weirdly, being his own man. The juxtaposition of him as a candidate with his courage and leadership in Afghanistan was jarring. Next time out, and MC hopes he runs in the future, he needs to have fewer handlers, fewer endorsements by people who don't count and more authenticity. Speaking of authenticity and handlers, the Romney team in Minnesota deserves special scorn. 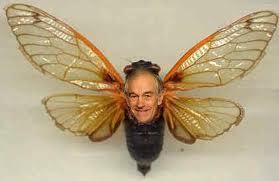 Out of touch, fossilized and full of themselves, they embody the worst of what the Paul people think of the establishment. Ben Ginsberg, still apparently angry at his age that he's not taller, glowered at the floor from his cocoon of men in black, never deigning to make eye contact with the locals, let alone speak to them. No. He'll get paid but what mastermind thought it worth his fees to have him and his consiglieres in Minnesota? Maybe he's one of those "I like to watch" types while the, uh, whatever is going down. Jack & Annette! Meeks were a ghostly presence at the convention, as was yesterday's man Ron Carey. The "conservative unity" slate put together at the last minute was a joke before the flyers were even printed. The always tone deaf Michele Bachmann let herself be put on it for reasons unknown to MC. She lost on the first round of balloting but the always brilliant tactician Stebbins had the 13th place Ron Paul winner move aside for her. 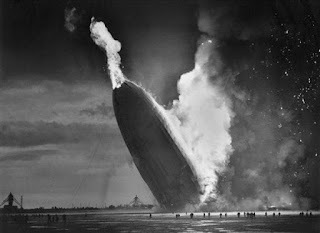 [MC thinks she had orders from the Mother Ship] Had Bachmann any dignity, she would have declined after placing approximately 150 votes back. She doesn't and she didn't. Tampa, if possible, just got more garish. One flyer got a lot of attention and its author given a standing ovation of boos: the one signed off on by MC but put together by those Romney geniuses. The "chaos" flyer apparently got the delegates into a lather. Bully. But it was really small beer in that it simply suggested the Ron Paul slate would cause chaos (a true downgrade from revolution) in Tampa. 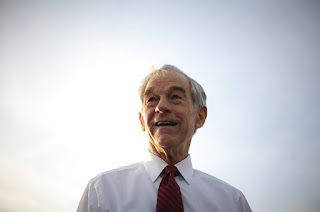 The Paul zombies think Romney can be denied endorsement on the first ballot and then the convention would unite behind Ron Paul. No, seriously. Welcome to the fetid swamps from which his supporters hail. MN GOP Chair Pat Shortridge couldn't help himself and condemned the flyer as "offensive." We're all sensitive liberals now, apparently. He received roaring approval for saying so. Such is his reward. MC understands the need for a foil. How to monetize that, though? Curiously there was no condemnation when the delegates booed the mention of Israel by Mark Miller, head of the local Republican Jewish Coalition. So too a lack of condemnation when a speaker called for unifying behind Mitt Romney and was booed. Yet those who are opposed to Ron Paul because they actually know who and what he is about are said to be an obstacle to party unity. Curious. Shortridge did ask, to his credit, MC about the boos for Israel. Rachel Stassen-Berger of the Star Tribune tweeted it as fact and she's a good reporter. Mark Miller told MC he was booed as he spoke. Shortridge said he would reel them in. Great: keep your anti-semitism private. Such is progress measured in today's MN GOP. Unfortunately, MC wasn't able to give final approval to those on the chaos flyer before it went out and would have stricken the name of Jennifer DeJournett. MC tried to convey this to her at State Central but literally got the finger from her instead. That's fine: when you only get 300 votes for national delegate you have much larger PR problems in the party than MC's chaos flyer. But by all means blame MC; happy to be a foil once again. Amongst many low points of the circus masquerading as a political party convention was RNC man Jeff Johnson's address to the convention. Channeling his inner Pawlenty, Johnson pretended to leadership by castigating both "sides" of the ongoing dispute which, heads up Jeff, is nothing less than the take over of the MN GOP and its hollowing out from the inside by people who believe there is no difference between Obama and Romney. As Peter Glessing @pgless tweeted: "Thanks for the scolding." One can see Jeff helping Amy Klobuchar make us all hot tuna noodle casserole and then tucking us into bed for the night. Johnson's problem, like so many of the old guard, is that he just doesn't get it. His insipid speech won much applause: the first sign of danger and believing in your own press clippings. But an equal smack to both sides and a Rodney King-like appeal to "just get along" isn't strong, brave or admirable. Did Johnson call out those who booed uniting behind Mitt Romney? Did Johnson condemn those who booed Israel? To ask the question is to have your answer. Of course the press ran with his tag line of "get over it" as he knew they would. Thanks, Jeff. Oh by the way? Iceberg, dead ahead. Keep lining up those deck chairs. Any number of resolutions got passed as well but MC is aware of only one: the MN GOP is now officially on record as demanding the end of the fed. Thank goodness for getting over it: we can become as crazy as the zombies who took us over. As a state central delegate, the only bright spot for MC was the election of Janet Beihoffer to the RNC for a full, four year term. Incumbent lobbyist Pat Anderson lost in a landslide. The state central committee is the last redoubt of what the RPM used to be. The Paul zombies are looking to take it over next year but plans are already in place to prevent that from happening. Beihoffer now needs to shed her task oriented focus and become more of a big picture woman. This means being less abrasive and letting people finish their sentences. And stop tying herself to IBM: for the younger generations this is Jurassic Park. MC supported Janet and is confident that with a bit of polish she'll represent Minnesota extremely well on the national stage. She waged a flawless campaign. Thank you, Janet. Although the end note was good, on balance the 2012 MN GOP convention was a disaster. Kurt Bills won't be able to raise the money needed to defeat senator for life Amy Klobuchar. Large donors have already closed their checkbook. But get over it. With him at the head of the ticket the GOP House and Senate majorities are further imperiled. But get over it. The sweep of delegates and alternates by Ron Paul could be seen since the February 7th caucuses. But get over it. The Republican Party of Minnesota is currently unrecognizable. But get over it. Enough with Vichy Republicans. Lots of us aren't over it and won't be. It would be a mistake. We'll take the party back eventually. Then those who cooperated in its surrender will be held to account. UPDATE: MC requested permission to use the original photo used in this post but was denied by the Star Tribune. MC respects copyright and has since substituted the graphic you now see. MC is awaiting a link from the Star Tribune so readers can see Stubbe's brilliant photo on a site where the paper controls its own copyright. This isn't tyranny; it's the rule of law. The hideous Ron Paul invasion of the Minnesota Republican Party is not quite over--the denouement known as its state convention in St. Cloud this weekend awaits--but enough evidence is in hand to draw some grim conclusions for those who are not enamored of a Jew hating fringe cult political figure who speaks to alienated, fairly ignorant and frequently unwashed lost souls. There are just enough exceptions to this characterization on an individual basis to prove its general truth. The Paul zombies™ tried their best last cycle and were rebuffed by the party establishment. To these strange persons this was akin to living in North Korea. Their bleating about tyranny is perhaps the easiest example by which to show how they are simply not serious people in a political sense. They have no idea what tyranny is except the infantilized one fed them by friend of David Duke Ron Paul. What's new and extremely disturbing is their winning of party positions on a variety of levels throughout the state. The old guard, to use a term it seems impossible to get away from, tells itself that these interlopers will soon fade away as they did in previous cycles. MC disagrees and believes that hope to be profoundly misguided if not outright dangerous. More, the idea that they can be worked with is positively delusional, a willful refusal to look at and admit what has recently happened. It's like those poor Russians who said, during the Great Purge, if only Stalin knew. Guess what? One measure of their malice is found in a recent email from the newly elected chair of the 4th CD, John Kysylyczyn. A laughable fool and former disastrous mayor of Roseville more than a decade ago, he was put forth by Marianne Stebbins--chief zombie in Minnesota for the Jew hater--over then current chair Jim Carson if the party didn't bow to her demands. Much to and fro was had, involving Pat Shortridge, Matt Dean, Pat Anderson (the stealth zombie choice for RNC) and others. Because Shortridge would not capitulate to Stebbins' demand to remove certain people from various convention organizing committees, the idiot was elected by his fellow morons. Carson was shocked but those of us who had been paying attention were not. MC usually doesn't employ such language as idiots and morons but unless the reader has actually met these Paul zombies™ they have no idea how true such characterizations are; not ad hominem but veritas. Mike B. has forwarded me some concerns that you have concerning CD4 activities. First, no full committee meeting has been scheduled. Second, the exec committee is planning on meeting at the state convention. I anticipate that we will set some of the schedule for the coming year at that meeting. Third, CD’s have nothing to do with legislative races. It is clearly stated in the constitution. We also have little to do with the congressional district race. We are not the candidate’s committee. In fact, we are not the committee of any candidate running for office this fall. To be frank, it does not matter if we are up to any particular speed for this fall’s elections. I understand that many may not agree with this or maybe things have been done differently in the past. As someone new to the position, I sat down the first week on the job and read the state and CD constitutions and the bylaws. My analysis is strictly based off of those documents. There seems to be this mistaken belief that the CD is some sort of super campaign committee. It is not. There also seems to be this mistaken belief that CD’s win elections. This is not true. Candidate committees win elections. There also seems to be a mistaken belief that CD’s sort of bind together BPOU’s that choose to operate as house districts. This is not true. We are required to hold four full committee meetings per year. It is my intention to have 4 full committee meetings a year. It is my intention to have actual agendas for meetings and a real purpose for having a meeting. Every time we have one of these meetings, there is potentially 100 of our best volunteers who are not spending an evening on the campaign trail. That is a lot of manpower. Meetings need to exceed this expense of manpower. I don’t believe in holding meetings for the sake of holding meetings. Meetings are for the purpose of getting specific business done. In the past, there appears to have been a cattle call mentality concerning the calling of meetings. Just have one every month. It doesn’t matter if we have any agenda. Don’t bother sending out agendas. Whoever shows up does. Fill the time allotted. To be clear, I do not operate in this fashion. When we call a meeting, there will be a specific agenda. We will have everyone’s email address and they will get the meeting agenda. Meetings will be for members participation only. We therefore need to know who the members are. This takes time. Normally we have elections in the odd numbered years. We have 18 months until the next election. In redistricting years, we have 6 months. Moving forward in an organized fashion takes time. But let me be clear, the bottom line is that no candidate’s campaign is affected by the efforts of the CD. Any excuses claiming such, is just an excuse on their part to place blame if their campaigns are not successful. Frighteningly, Kysylyczyn now runs a day care center. Is stupidity contagious? It's no wonder he's never held elected office since his stint at mayor; no wonder he's a perfect rube for Stebbins. She has an army of them. She prevented Joe Westrup from being elected to the State Executive Committee from the 4th CD and instead rammed through a Paul zombie™ who is barely sentient. 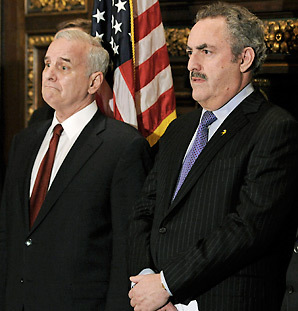 All of which presents the question: is it time to bring back the Independent-Republican Party of Minnesota? The Paul zombies™ can have the RPM; what, really, is left of it? Why the party jettisoned the IR structure in 1995 can be discussed another time. What real republicans in Minnesota need to discuss amongst themselves is whether resurrecting the IR is a good idea and, if so, how to go about it? Republicans in CD 4 are organizing and meeting on their own outside the Kysylyczyn circus. This perhaps forms the germ of a future IR party. Or not. What happens at State Central is crucial: if Janet Beihoffer is elected to the RNC for a full four year term, the party as currently known may be salvagable. If she isn't, it most likely is lost and another vehicle for real republican ideas and candidates must be found.